Researchers at Purdue University just made high throughput screening, a process often used in drug discovery, 10 times faster than previous methods. "The area of high-throughput library screening reached a plateau, where the fastest screens took about eight seconds per target," said Graham Cooks, the Henry B. Hass Distinguished Professor of Analytical Chemistry at Purdue, who led the research. "If you can reduce that time by a factor of ten, which is what we're reporting, then you can potentially do library screens that might have taken months in days." 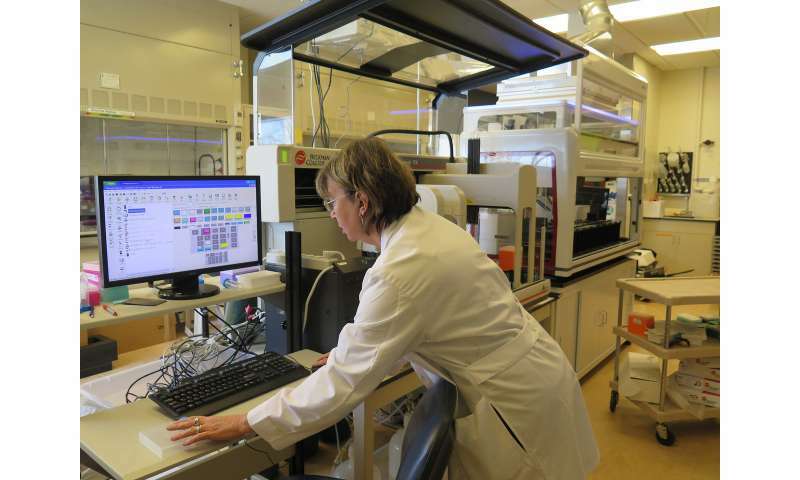 High-throughput screening uses robotics, data processing software, liquid handling devices and sensitive detectors to quickly conduct millions of chemical, genetic and pharmacological tests. It allows researchers to identify active compounds, antibodies or genes that modulate a particular biomolecular pathway, which is especially useful for drug discovery. Cooks' lab combined desorption electrospray ionization (DESI) mass spectrometry, a method of making ions from solid samples, with robotic sampling technologies to create a faster screening process. The research was published in the journal Chemical Science. DESI, which was originally developed for biological tissue imaging, sprays electrically charged droplets at a sample, from which ions are generated and then collected and analyzed in a standard mass spectrometer. This method was also developed in Cooks' lab at Purdue. "We are spraying a solvent onto a mixture and creating a new product, which we're seeing in a splashed droplet," Cooks said. This technique allows researchers to perform a reaction and analyze the product in one step, in one second. That's the power of it, Cooks said. The research was supported by the Defense Advanced Research Project Agency's Make-It! program, which aims to develop technology to create any particular chemical from cheap raw materials. Five research institutions are involved in the program, and Purdue's task is to develop methods to rapidly analyze the results of reagents being mixed together under particular conditions. The project's objective is essentially to rationalize organic synthesis. "How do you do that? You have to create some accessible knowledge base, which says that that if you combine sample A with sample B you will get sample C," Cooks said. "There's an algorithmic knowledge base that needs to be constructed, and then there's the conditions under which particular reagents are examined. So it's not only the reagents, it's also the solvents, the catalysts, the physical conditions that we're looking at." The current methods for designing and producing new synthetic molecules can take years between initial design and final production. Increasing the rate of discovery and production of molecules could lead to advances in several areas crucial to national security, according to DARPA.